The population of Australia is 519,166 in 2017. The population of Tasmania is 515,00. Hi. Coco and Lola here. Tasmania is a very beautiful island and is home to the Tasmanian devil and the Tasmanian Tigers (the Thylacines). They were the biggest marsupials in Australia but they are now extinct. Some of our other native animals are the wombat, the pademelon and the platypus. Here is a link to a site where you can find out more about these animals. We were wondering what some of your island animals are? One of our native plants is a tea tree. (It got its because Captain Cook used the leaves to make a ‘tea’ drink). What are some of your island plants we would like to know? We have a big mountain called Mount Wellington and in winter people go up it to ski. We have a great bush scenery and are famous for our amazing National Parks. Here is a YouTube clip showing some of our famous places to visit. Tasmania by Ben and Will M.
Tasmania has lovely bush and scenery. Wineglass bay on the east coast is a beautiful beach and people come from all around the world to see it. It is part of Freycinet National Park. 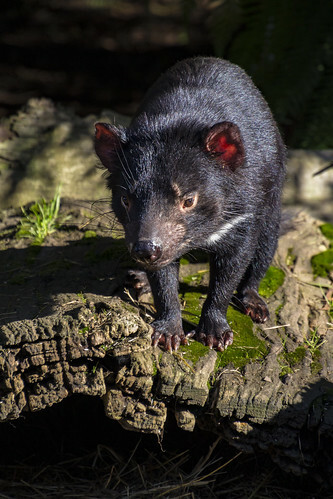 Tasmania Is home to the Tasmanian devil, and was home to the Tasmanian tiger which is now extinct. The Tasmanian tiger was the biggest marsupial but it is now extinct. The last Tasmanian tiger was called Benjamin but it was, surprisingly, a girl. In Australia more people die surfing than they die from shark attacks every year. Hobart is the capital city of Tasmania. Our school is close to the city and is the third oldest school in the country. Tasmania was originally used for convicts brought from England. Some convicts had only stolen a loaf of bread to try and feed their families. The history of Tasmania is very interesting. Tasmania is home to 250,000 people and is cold in winter but we mostly have lovely summers. It has snowed at my house just once – it was a lot of fun! We can have weather up around 30 degrees hot and -6 cold. Our most famous native animals are the Tasmanian Tiger (now extinct) and the Tasmanian Devil (pictured below). We have a lot of berry fruits, apples (we used to be called the Apple Isle). Good bye for now. During our holidays I had a teacher contact me from a very small school on Put-in-Bay, Ohio- an island in Lake Erie, USA. She only has one 2nd grader (Miyah) and one 3rd grader (Emma) among others, who would love to have someone read their blogs and comment. As we also live on an island, which belongs to a larger island, (Australia is classified as a continent and an island), our first blogging task is to also write a post about life on our island. You are to include at least one picture and perhaps a short YouTube clip (past bloggers only for this). I would then like you to read the posts on Island Life (on the sites listed below) and choose at least one to leave a comment. You are to leave your blog URL in your comment. Visit http://bunnyherolabs.com/adopt/ to check out these pets to help you to decide which one is perfect for 2/3M. It’s time to vote! Which pet will we adopt this year?